If you have worked on large drawings or have had to zoom in and out a lot you may have noticed that curved objects like circles and arcs appear blocky or look more like polygons rather than circles. Don’t worry, you have options to fix this. 1) Set the system variable WHIPARC to a value of <1> This variable determines if curved objects is displayed as a smooth curve or as a series of “vectors” Setting this variable to <o> (zero) turns off the smooth curves. 2) Change the “View Resolution” in the command line. VIEWRES <enter> Y <enter> to acccept “fast zooms” then set a value up to 20,000. The lower the value, the more blocky circles and arcs will appear. With newer computers, you should not have any problems settings this to the maximum value of 20,000. 3) Set the “View Resolution” in the Options Dialog box. Open the “Options Dialog” by either entering OP <enter> or by a right clickin the drawing area and selecting “Options”. thanks a lot for the help and the easy way for explanation. In that case you need to professional software restores autocad files any version. ok thanks for the tips, I also want to ask for further levels: how the circles and arcs as in extruded (EXT) so as not to look like polygons. ISOLINES from to try to keep this low. The default value is 4, Try changing by increments of 20 and see what works for you. How to change Arc smoothness permanently? Now I need to change it in each drawing separately. If you have a startup routine in an anad.lsp or acaddoc.lsp you can add the changes there. The WHIPARC variable is saved in your registry so it should remember that setting regardless of what drawing is opened. The command VIEWRES however is not a “setvar” (variable) it is a command that may be different in each drawing. What does that 20000 indicate ? Is it the resolution or something ? Why is it set as the maximum value ? 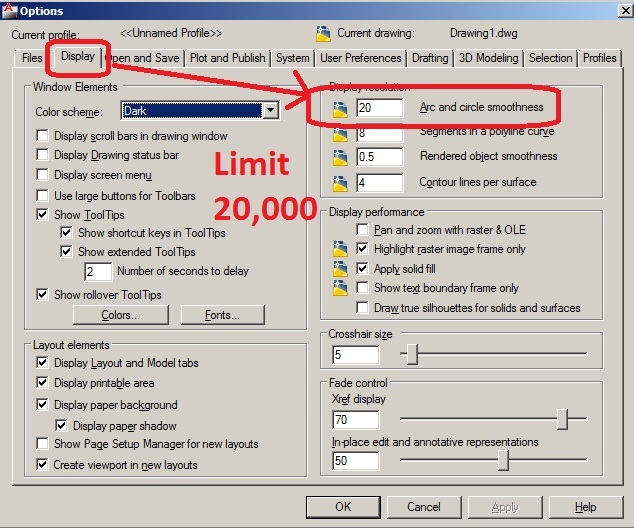 The following link describes the VIEWRES variable as a control of the “Zoom percentage” so the higher the number, the faster/smotther it regenerates curved objects. Thanks for the tip and excellent “step by step” walk through! I’ve been working with AutoCAD for over 10 years and am still learning new little tips and tricks everyday. By the way, I have a question you fellow drafters may be able to help me with. Several years ago I worked with AutoCAD Mechanical and that version had a “Join Entities” command. It was EXTREMELY useful but I haven’t been able to find a lisp routine for it or find anything about it on all these forums. Any help would be appreciated. Unfortunately, I can’t find a suitable version (LISP, .NET or.VBA) alternative outside of the AutoCAD Mechanical command. I also noticed that the above link describes the command differently than the newer (2015) version. Is the older version’s functionality not available in the newer version? Perfect fix… It was viewres for me. Just a note. your webpage is not loading properly you may want to check your code……. Great content always trumps visuals anyway. Thanks frankie – I am glad it helped. I am wondering if you are viewing the blog (or internet) through Internet Explorer? I know that SketchUP is no longer a google company but I do think thatthe why in which google maps (which uses .kmz & .kml files) processes the geometry the same way now – as it did when you export a SketchUP file as a .kmz file. The command regen never worked with me. while using spline it is very hard to control it, it goes in a zig-zaggy way, especially in 3d modelling.I donno how to use it,it goes in all 3 axes.How to control it? are there any settings for it? I have this problem with Cylinder in a 3D design. I follow the steps in this tutorial, but it dose not worked. “Specifies the number of contour lines displayed on the curved surfaces of 3D solids. Try setting it to 10 and see if that helps. Don’t go overboard with this setting. I though for sure these tips would help, but no. When I select a polyline, a dashed (smooth with fine arcs shape) is displayed so I can see what the shape should be. But I can not get it to display right when un-selected. Any other ideas? Thanks!